As a matter of principle glass is not heat- or shock-proof (the exception: borosilicate glass such as Pyrex, etc.). Never let candles burn down completely. If glass becomes very hot it will crack or become subject to stress. 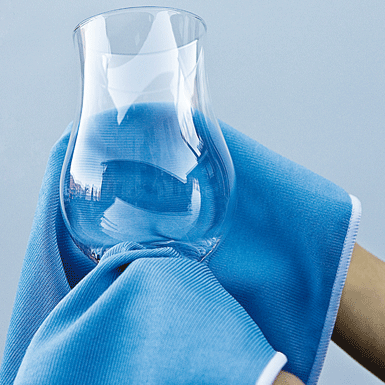 Thick walled glasses in particular should only be washed by hand using lukewarm water. Glasses can also crack or become subject to stress if the water is too hot. Over time direct sunlight can also subject a glass to stress which can become so great that the glass breaks spontaneously. When washing drinking glasses and glass bowls in dishwashers only use gentle or glass cycles at a maximum water temperature of 55° C (45° C would be also be sufficient). If required, have the water temperature checked and adjusted by a specialist technician – applies in particular to older dishwashers. Use specially designed, high quality branded detergent and follow the manufacturer’s dosing recommendations. Check rinsing agent and dishwasher salt levels regularly (carry out a pre-wash cycle after replenishing dishwasher salt). Glass items should not be washed together with frying or saucepans. Some metals oxidise or are attacked by detergents – this can result in a lye solution causing glass surfaces to become dull – a single cleaning cycle is often sufficient to cause this effect. Incorrect loading of items in the crockery or glass basket is one of the main causes of glass damage. Glasses should not touch each other – this is the only way to prevent scratching. Glasses are checked for stress after being manufactured and, as a matter of principle, are only sold unstressed. Cracks in glass are thus usually a result of incorrect handling.